On my hike today I was greeted by two medicinal plants. One I had met before on my hikes, skunk cabbage and one I met for the first time, horsetail. The Skunk cabbage was a beautiful large and vibrant plant, but it was alone and a little out of its element since the swamp waters of the area had been drained. This didn’t seem to stop it from flourishing. 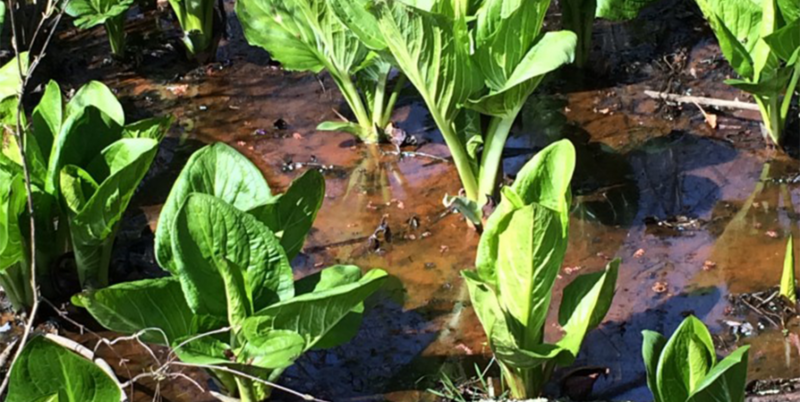 Skunk Cabbage (Symplocarpus foetidus/Dracontium foetidus) is one of the first plants to flourish each spring. It usually is found at the edges of swamps where it generates a chemical heat which melts the winter ice and signal to hibernating animals that it is time to emerge from their sleep. 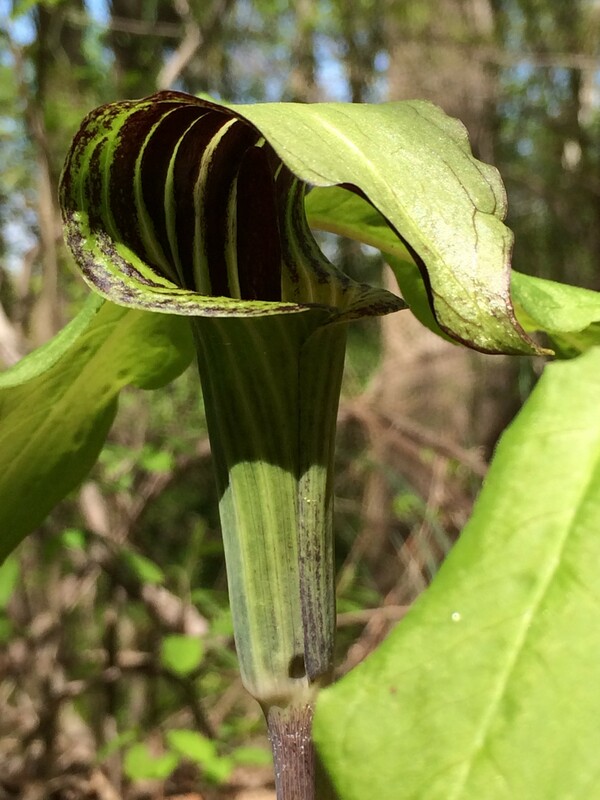 It is from the family Araceae which includes Jack-in-the Pulpits , Arisaema triphyllum ,a plant I enjoy finding on my hikes at the National Colonial Farm in Accokeek , MD. Traditionally the Micmac peoples used a decoction of skunk cabbage to treat diabetes and the Haudenosaunee (“Iroquois”) peoples valued its properties to eliminate parasites. Today some still use tinctures of Symplocarpus foetidus for asthma and other lung related diseases as well as topical applications for its anti-spasmodic effects (Donahue, 2010). Symplocarpus foetidus is very high in oxalate crystals and should never be consumed raw. Processing the root medicine with drying, heat and preserving with alcohol will decrease the amount of oxalate crystals. It is possibly unsafe for use during pregnancy (WebMD) which is confirmed by the Haudenosaunee people who use the seeds to bring on childbirth (Donahue, 2010). With its high oxalate content, it might also be unsafe for those with a history of kidney stones. I last met Symplocarpus foetidus with my colleaugue and fellow herbalist, Betsy Costillo during our medicine making class. 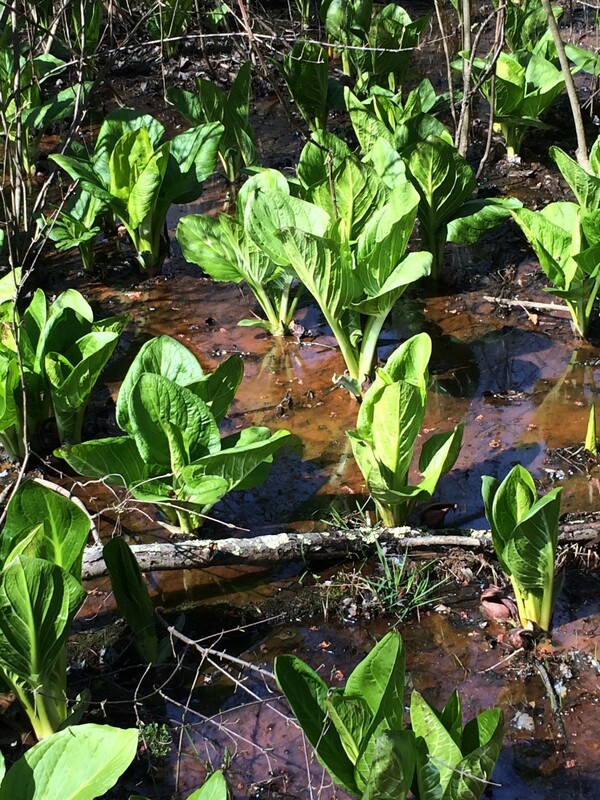 Our experience of wild harvesting the skunk cabbage root was a muddy one! This plants roots take some work to release from their muddy habitats. Symplocarpus foetidus’ message to me this spring day is to rouse from my own sleep of inaction and get on with my life’s work. The other plant I met today was Horsetail,Equisetum arvense. I didn’t recognize this plant at first because I had only ever seen it with its tall green jointed stems. What I found today was the early spring fertile shoots. At this stage they lack chlorophyll and are considered the fertile time when their cone-like tips begin to produce pollen for reproduction. One of the amazing things about Equisetum arvense is that it sends deep roots down to the rock bed where it extracts minerals which It brings up to its cells. This is one of the key medicines it offers to nourish us. 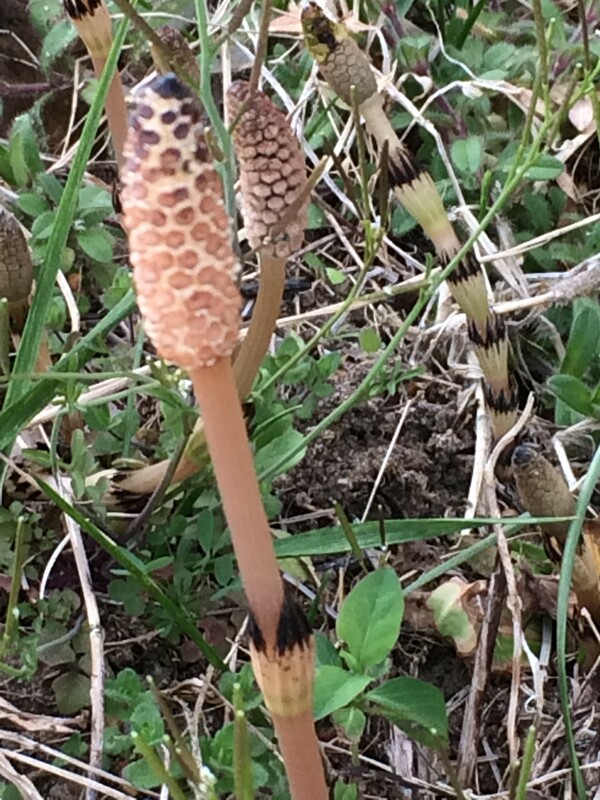 It was also interesting to note that both Equisetum arvense and Symplocarpus foetidus have historic indications for supporting lung function. Horsetail with its rich mineral content is also supportive of bones, skin, hair and nails with its rich silica content. 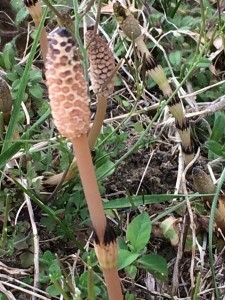 Unlike Skunk Cabbage, the tender young tan-colored shoots of horsetail can be eaten in the spring. 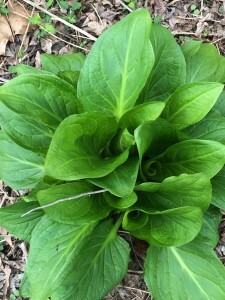 As the plant matures, it produces an enzyme which decreases vitamin B1 in the body. This enzyme is sensitive to heat and can be destroyed by heating and drying the plant but should not be eaten raw (Krohn, 2013). I am grateful for the plants I met on my hike today. Connecting to nature’s abundance helps remind me of the endless possibilities and the reliability that spring always follows winter.